The chord progression of this lesson is based on the real book version (which is notorious for having mistakes) but with some little modifications. Bar 10 and 26 : Real book says F-7b5 and Bb7. In this lesson these two chords are replaced by Db7#11. The last 5 bars have so many changes on different recordings that it’s hard to say what the right chord progression is. Bar 28 : G-7 and C7 have been replaced by F7 and Gbdim7. Bar 29 : Ebmaj7 has been replaced by G-7. It is a common substitution which consists of replacing the Imaj7 by the IIIm7. 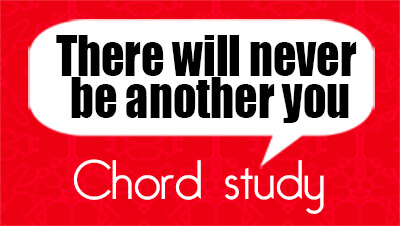 There are many ways and to develop and embellish a chord progression. For example, by adding extensions to a chord, by replacing a chord by another one, by using drop 2 chords and inversions. To make this lesson clearer, the rhythm has been voluntarily simplified and some chord names (or symbols) do not always correspond to the real name of the used voicings. They are detailed a bit further in this post. Here are the chords used in this lesson. You can see that they are all played on the top four strings of the guitar. 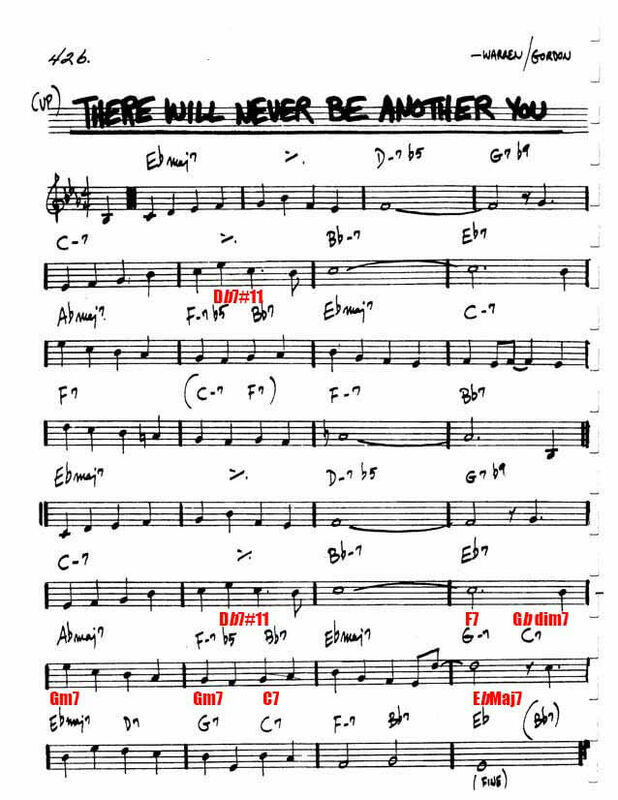 Bar 1 & 2 : This chord is an inverted drop 2 voicing (rootless) of Ebmaj7 with the 5th in the bass. It can be renamed Ebmaj7/Bb or even Bb6. Bar 3 : Ab6 instead of Dm7b5. Can also be thought as a Dm7b5 wihtout a root. Bar 5 and 6 : Drop 2 Cm7 with the b7 in the bass.Cm7/ Bb. Bar 7 : Drop 2 Bbm7 with the b7 in the bass. Bbm7/Ab. Bar 8 : Drop 2 Eb9 with the third in the bass and Gdim7 that can be thought as a rootless Eb7b9 chord. Bar 10 : Db7#11/G. This is a drop 2 Db7 without the root but with a a third in the bass (F) and a #11 (G). Bar 11 : Drop 2 Ebmaj7 with the third in the bass. Bar 13 & 14 : Drop 2 F7 chord. Bar 15 : Drop 2 Fm7. Bar 16 : Bb7 with seventh in the bass. Bar 18 : Ebmaj7add13.As its name impliesn there is a 13th (C) added. Bar 19 : Drop 2 D half-diminished chord with b7 in the bass. Bar 20: Bdim7 instead of G7b9. Bar 21 : Drop 2 Cm9 chord with the b7 in the bass. Bar 22 : Cm7add11/Bb chord with the b7 in the bass instead of Cm7. Bar 25 : Drop 2 Abmaj7. Bar 28 : drop 2 F7/A and Gbdim7, can be named Abdim7. 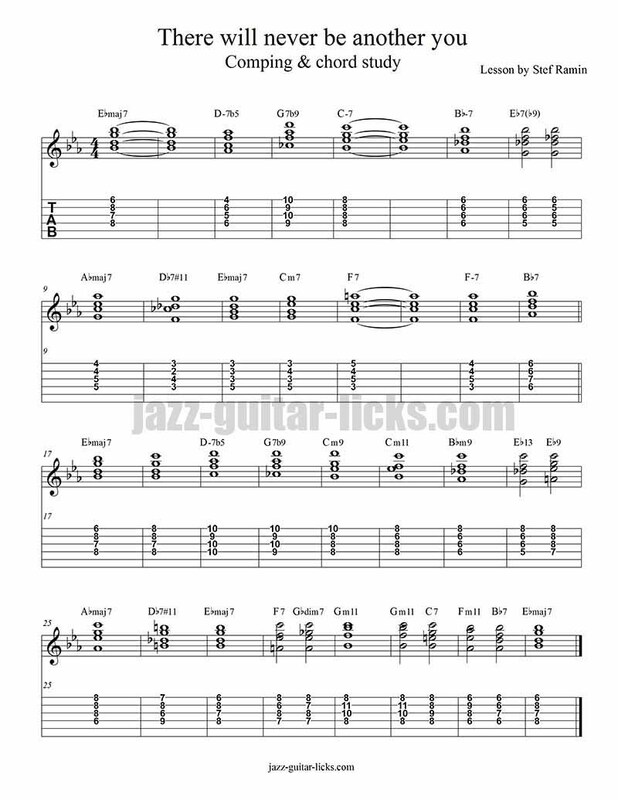 Go check the lesson about diminished 7th chords to understand the symmetry.